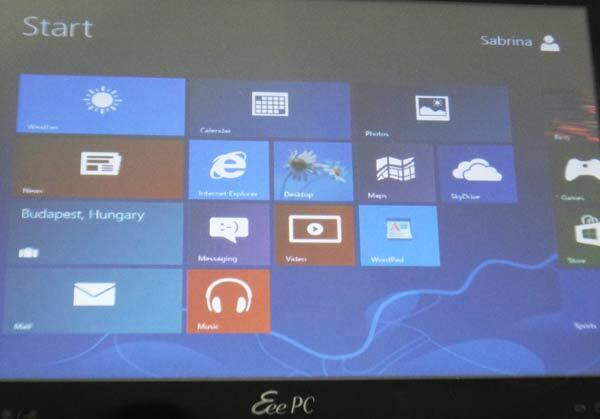 Windows 8 will be released tomorrow, and I got the chance to have a preview, testing it on a tablet Eee PC. The metro interface is really a surprise and a remarkable difference from the traditional Windows interface. It resembles the graphic and interaction of a tablet or smart phone, but I assume that most computers don’t have a touch screen… so I don’t really see the advantage of having such big buttons. It seems a copy of the iphone/ipad interface, but it was copied poorly… a ‘samsung strategy’?! Now, I would think that this interface is particularly suitable for tablet PCs with touch screen, like my Asus tablet. But… no! The metro interface doesn’t work on such netbooks because the minumum screen resolution is 1024 x 768 and most tablets PC have 1024 x 600, so you can’t use it! Anyway, there are tricks to make it work if your computer has a smaller screen resolution. In Windows 8 there is no start button, and you can’t really close the applications you opened, which seems kind of confusing. You have to pull out the menu from the right side of the screen toward the center. A few options will appear, including “option”, under which you find the buttons for switching off the computer and “start” which will take you to the metro interface. The list of programs doesn’t exist anymore: you’ll find them in the metro interface, and you can re-arrange them as you like. This last option seems to make some sense. If you are missing the start button too much you can get it as an application, and get your computer to show the traditional desktop when it turns on. Yet, since Microsoft made a considerable effort to create a completely new interface and a new interaction logic, I am not convinced that this one is really worth it. It would have been more useful to have a completely new “metaphor” – neither the desktop nor the big buttons – but for instance a new logic which groups items (docs, pics, emails, links) by theme rather than by application. Thanks Diego for all the info and set up! The IT giant IBM has a Research center in Zurich, with over 3000 employees working on very exciting topics, from nanotechnology to information analytics. We just had the opportunity to visit the center and listen to a full day of presentations. We also had the opportunity to see technologies demos of augmented reality for retail, infovis for music and even Watson! The visualizations: information visualization for searching music and movies. The CSCS (Swiss National Supercomputing Centre) moved the biggest Swiss supercomputer to Lugano. The new building is right in front of the stadium. Recently the center had an open day in which the general population could tour the new center and learn about the uses of supercomputers for research. The event has been very instructional, and attracted a large number of people. But, as the CSCS expert said, this is just the tip of the iceberg: below this level there are two floors wherer the resources (electricity and water for the cooling system) are stored and distributed. The floor dedicated to the distribution is usually around 60cm, but here in Lugano they like to do things well… their floor is 6 meters! The supercomputer actually uses the same processors as in our normal computers, but it uses thousand of them in parallel. Indeed the difficult part is to coordiante them. Only in supercompuers you find that each board has an (expensive) part dedicated to the communication with the other processors. At the center they had conferences and talks to explain the history and function of the supercomputers. 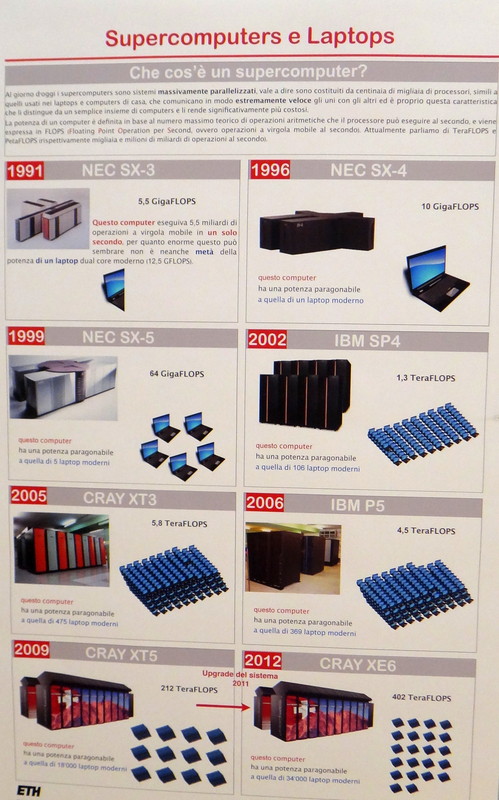 The following poster explains (visually) the evolution of Swiss supercomputers… impressive. The supercomputer of year 1991 had half the computational power of a normal laptor we use nowadays! The biggest supercomputer they have in Switzerland, the Monterosa in the picture above, can calcualte in one day what your computer could calculate in 64 years! And what do they do with all these computational resources? Supercomputers are used mainly by scientists for two tasks: simulation (astrophysics, analysis of structures, chemistry simulations, etc), and for the analysis of large quantities of data (i.e., for the recent CERN particle acceleration experiment or to analyze genetic data). The service is free for scientists, which have to submit a proposals for their project: an international panel fo experts evalates the projects and their scientific relevance, and eventually grant access to use the facilities of the center. Nothing is secret here, the scientists are expected to publish the results of their studies for which they used the suercomputer. The supercomputers are also available for commercial use, but not for free. For instance the center for Weather forecast is using one of the supercomputers to pridict the weather in Switzerland.